Dr. Wong Chuan Ning graduated from the University of Melbourne. She practiced in Melbourne for 2 years before returning to Singapore. 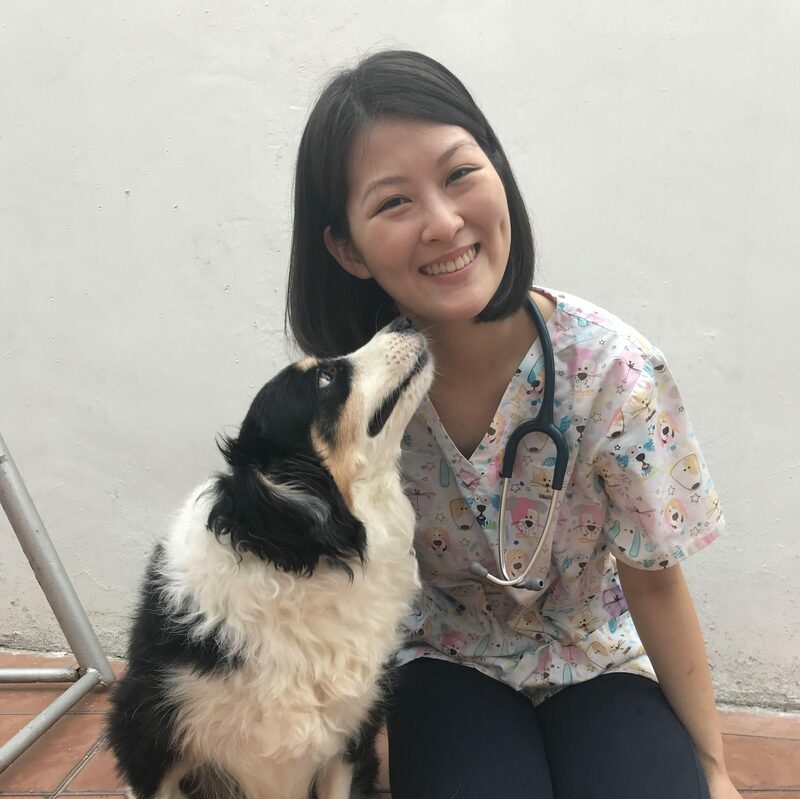 She has a keen interest in internal medicine and diagnostic imaging and has since completed a Certificate of Internal Medicine, Certificate of Sonology and Certificate of Thoracic Imaging from the University of Sydney’s Centre for Veterinary Education programs. In her spare time, she volunteers for SOSD and cooks food to share with her dog Bond. She is a Senior Veterinarian of TJV. 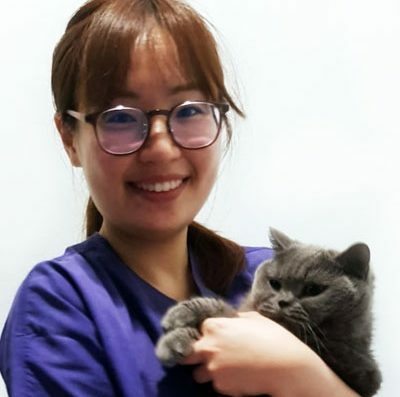 Graduated from University of Sydney, Dr. Grace Heng has been working with small animals since then. 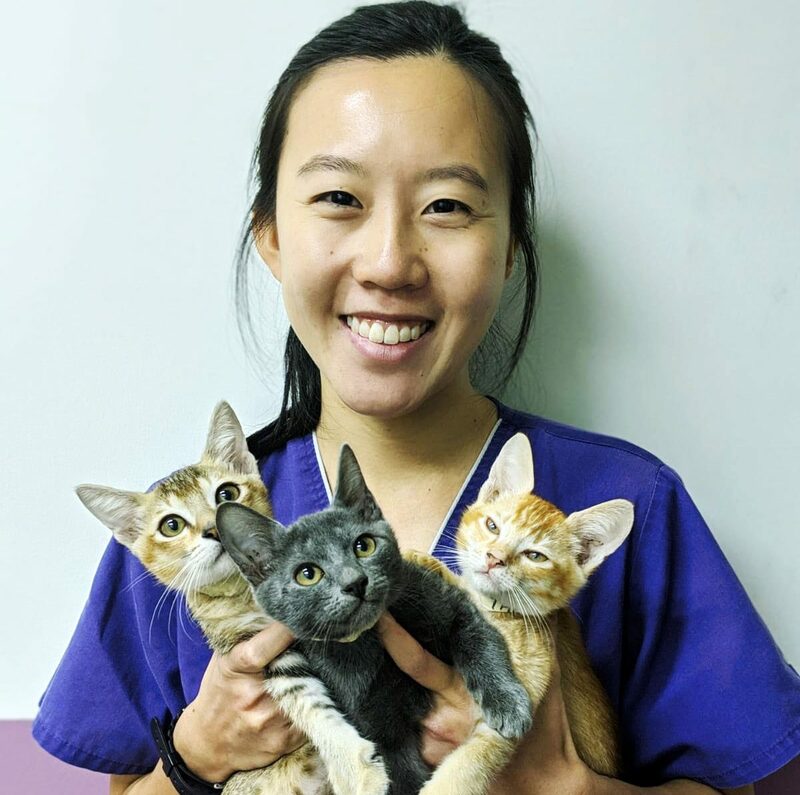 She works with dedication and compassion for her patients; always striving to help pet owners in making informed decisions on the conditions of their pets. 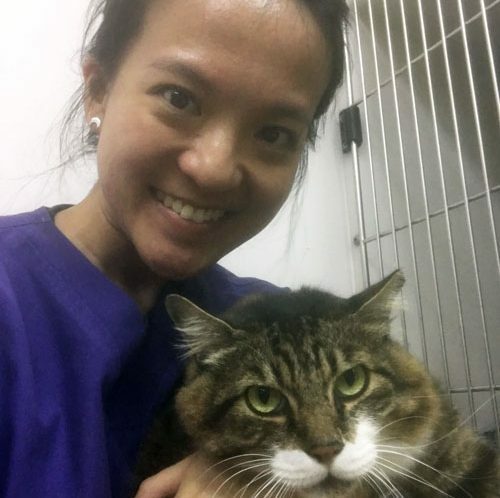 Besides developing and acquiring special interest in feline and rabbit medicine, she has an unwavering interest in soft tissue surgeries. Dr. Grace enjoys spending time with her own pets during her off days. She is a Senior Veterinarian of TJV. Dr. Clare Koh graduated from the University of Queensland. She joined The Joyous Vet in 2015. She has special interests in internal medicine. 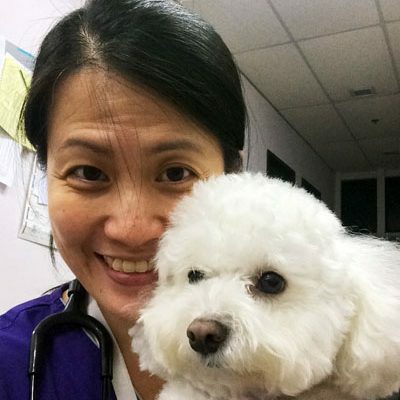 Through helping owners and their fur kids, she achieves a great sense of satisfaction, and keeping up with the latest information in vet medicine aids her to serve them better. Outside the hustle and bustle of the clinic, she is an avid drummer and buys more books than she can read. Dr. Chow Hao Ting graduated from the University of Melbourne and strongly believes in doing right by our animal friends. He strives to help pet owners make informed decisions based on their unique situations. 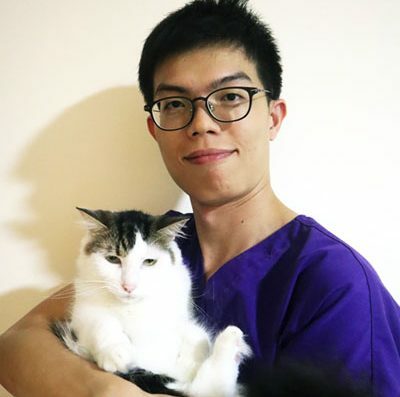 During his adventures in Melbourne, Dr. Chow fostered stray animals for the local rescue group and met his best buddy, Roco (the cat in the photo). Roco now enjoys life in Singapore as an Australian expat. Outside of the clinic, Dr. Chow works with various non-profit organisations and enjoys a good cup of coffee. 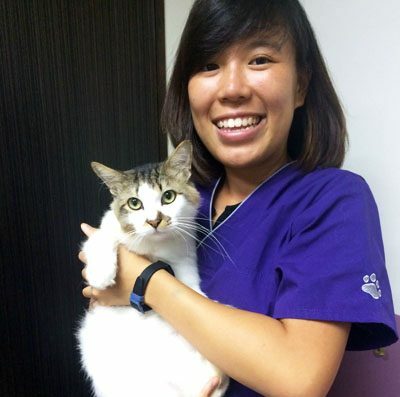 He also served as the Honorary Secretary of the Singapore Veterinary Association for the term of 2017/2018. Dr. Chan Vee Vien graduated from the University of Melbourne. She has an interest in both surgery and internal medicine in all species of animals and is especially keen on helping exotic animals. She volunteered in a few rescue centers in Southeast Asia and hopes to do so again in the future. She enjoys fostering animals and nursing them back to health while they wait for their forever home. She is currently the proud owner of three cats. She adopted her first cat from SPCA, took in a second cat which was involved in a car accident, and adopted a third cat which was a stray kitten she fostered. Dr. Tan Yan Ling graduated from the University of Sydney. 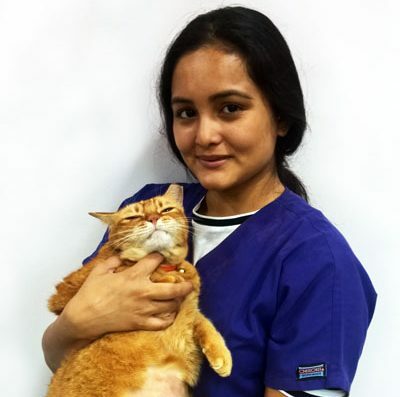 She has keen interest in small animal and exotic medicine, and keeps herself updated in these areas to provide the best care for your pets. She enjoys volunteering and her most memorable one to date was with the elephants in Thailand. In her free time, she plays badminton and spends time with her senior pet dog, Fritz! 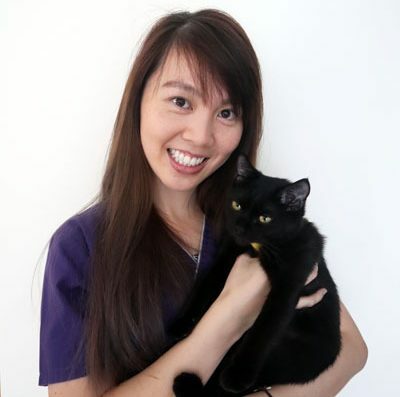 Dr. Tan Kate-Lin graduated from the Royal Veterinary College, London. She developed a keen interest in cardiology, internal medicine and nutrition during her years of study. Aside from keeping up to date with the latest advances in the field of veterinary medicine, she spends her free time reading and enjoys crafting. Dr. Chuah Ke Hui graduated from Murdoch University. She loves working with small and large animals. Her professional interests include small animal internal medicine and exotics medicine. She shares her home with three rabbits, a cat, a dog, and a few humans. In her free time she enjoys running, hiking, and doing nothing.